KCET 2019 Exam Date Released. Kar KCET Important Dates provided in the below sections. So, the candidates who want to apply for Karnataka Common Entrance Test can check the KCET Exam Dates 2019 given below. Therefore, the students can check all the details related to kea.kar.nic.in Karnataka CET Exam on this page. Latest News: KEA Announced the Karnataka CET Exam 2019 Dates. KCET will be Held on 23/04/19 (Biology & Mathematics) and 24/04/19 (Physics & Chemistry). Kannada Language Test is Going to Conduct on 25th April 2019. Karnataka CET Exam Dates 2019 is important to apply for the Examination before the last date, i.e., 28/02. Also, the student can get details like online application starting date, last date, and counselling dates. Karnataka Examination Authority (KEA) will conduct a KCET exam every year for all the eligible candidates. So, the students who are interested in the KEA CET 2019 can apply for the Engineering & Medical Entrance Exam on or before the last date. Karnataka CET Exam is conducted by the Karnataka Examination Authority. Therefore, the candidates who want to pursue their professional studies like Medical, Dental & Engineering can attend for the CET 2019. Everyone knows that planning and preparation are important for an exam. Students will have an idea to prepare for the KCET Exam. But they will have a problem while planning for the Exam. Exam dates are important because without having an accurate idea about the KEA CET Important dates we cannot do anything. So, to help you we have given the KCET Important Dates on this page. 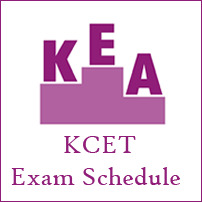 With the support of the KCET Exam Calendar 2019, you can easily plan for the KEA Exam. Look at this page and get an idea about the KCET Exam Schedule 2019. KCET is a common Entrance test organized by Karnataka Examination Authority. This KCET 2019 exam is conducted every year for providing the entry for various full-time courses like Engineering, Medical, and other fields. KCET is a State level entrance exam. All the candidates who completed their PUC (Intermediate) can attend for Karnataka CET 2019. As per the latest analysis every year 1.50 lakh students will appear for the KCET Exam for admission into 220 Engineering colleges in the state. Rank allotment for the students depends on his or her performance in the KCET exam 2019. Considering this rank card, all the private and government colleges of Karnataka state will give seats to the qualified students. Exam Dates plays a crucial role while preparing for an exam. If you know the KEA CET 2019 Exam Date in advance, you can prepare well for the examination. So, the students eagerly waiting to know the KCET Important Dates look at this page and start your preparation. For the sake of the students, attending for the Karnataka CET Exam we have provided in detail the Kar CET Important Dates. 1. KCET Notification released date 1st Feb 2019. 2. Starting Date of Online Application 1st Feb 2019. 3. Last date to apply Online for KEA KCET 2019 28th February 2019.